I've used Burt's Bees (#1 on the slide show) before. I smelled like a total man! LOL. It has a very pungent woodsy, herbal scent to it. I purchased it a couple of times online (drugstore.com) but now you can find them in target or any other store that offer natural products. I usually prefer (and need) antiperspirant but the best natural deodorant that works for me is the mineral salts. It's just a deodorant but the naturally drying nature of salt helps keep you from sweating. Which ones has the mineral salts? or is that the name of the deodorant? The Crystal Rock deodorant. Any brand will usually do. Sometimes they come in liquid form. I've used both the liquid and the solid- they're both effective but I prefer the solid form. Whole Foods carries a bunch of different brands. Remember, most natural deodorants are NOT antiperspirants. The antiperspirant ingredients in regular brands is pretty noxious and isn't used by natural brands. Yeah but are anti antiperspirants necessary? or can organic deodorants keep me smelling fresh all day? It depends on the person. For me, antiperspirants ARE necessary. I do sweat. I'm sure if I used any other organic brand I would smell fresh all day but I'd probably have to deal with pit stands. Lovely. So the next best thing that I've found was the crystal deodorants due to their drying factor. I would recommend that you pick an organic deodorant that you like, try it out for a couple of days (preferably on the weekend) and see if this is something that you would be confident enough to wear in a work place, school setting, or wherever it is that you spend the majority of your day. I've used the salt one for years, and it DOES work. You have to use it everyday, though. I use the Thai Crystal, and I got it at Whole Foods. I think all the crystals work on the same principle though. The chemicals in commerical anitpers/deos are terrible. 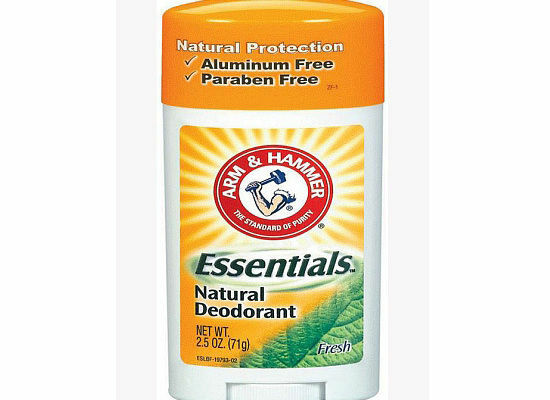 What about Arm & Hammer Essentials Antiperspirant? My vote is for Whole Foods or Trader Joe's. they carry much of those unique organic items. I've seen them at health stores like GNC, even Whole Foods. Unfortunately, the ones I've tried don't do much for me. The crystal only worked for a short time for me also. I haven't tried the Tom of Maine or A&H Essentials yet. But I am here in Texas where your deodorant better work. Oh yeah, I forgot to mention, I'm a man. I think that bit of info is very important.